My friend who arrived the day earlier decided to rent a car to give us added flexibility. As expected, it took about five minutes to go through security. 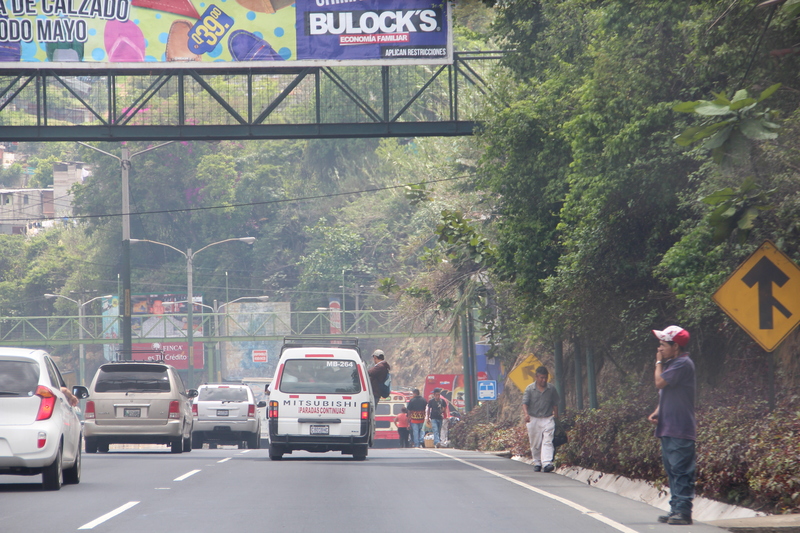 Outside of the airport, which is very small, there were numerous people offering shuttles to Antigua and Lake Atitlan. Outside of the airport felt very safe. There were several people panhandling, but they didn’t harass you. 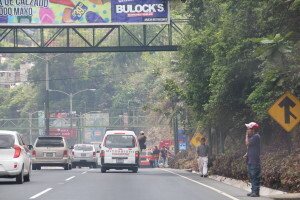 My friends who arrived earlier confirmed there is not much to do in Guatemala city. After getting picked up, we drove the 3.5 hours to Lake Atitlan. We hit some bad traffic in the city. 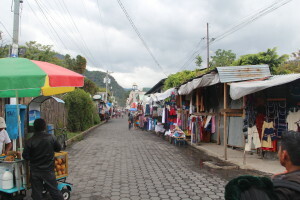 There is lots of fast food and local cuisine on the way to Lake Atitlan. We arrived around 5 and shortly after arriving, we walked to the lake. As with most touristy towns, there are lots of souvenir shops and restaurants. We were actually quite surprised that there were not a lot of tourists in Panajachel. We later found out that end of May (Memorial Day) is still considered low season for Guatemala. Americans don’t really travel to Guatemala. We enjoyed a beautiful sunset and grabbed dinner at Guajimbos. We then meandered our way into a number of bars in this triangle area. It was probably 80% local and 20% tourist on a Saturday night. We will see if mix of people changes on a Sunday night. The bars were packed, but they do close at 1am. Overall, it was a successful first day. We plan do a tour of the Lake tomorrow. We went out two times in Panajachel. We went out on Saturday and Sunday night. The bars were packed on Saturday. All of the bars were open. The mix was 80% local and 20% foreign. The mix did not change much on Sunday night, but there was only one bar open called Panarocks. This was low season, but I can’t imagine the nightlife is much better in other parts of the year. Most of the bars are in the triangle area. The only exception is Panarocks, which is around number 9 on the map below. The highlighted road from the Kodak symbol to the lake is the main tourist drag. 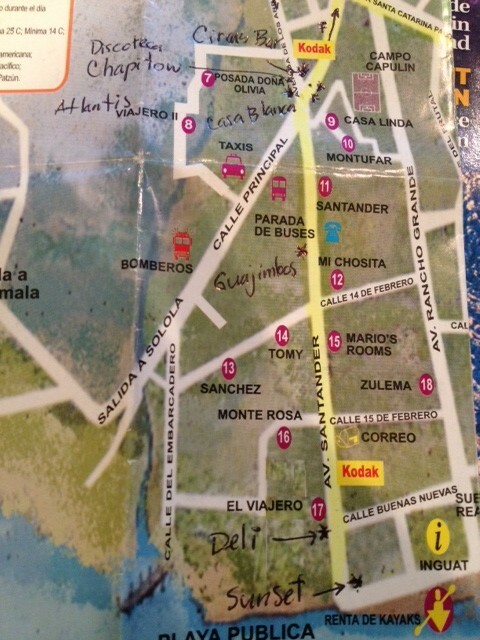 The top bars were Panarocks, Atlantis, Casa Blanca, Circus Bar (only bar in TripAdvisor), and Discotesa Chapitow. Circus Bar and Atlantis had the highest mix of foreigners in the bars, but they were also the least crowded. Casa Blanca, the Discotesta, and Panarocks were the most crowded. 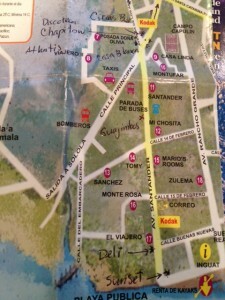 The bars in Guatemala close in 1 a.m., and we did not see/hear about any after our parties. There are afterhour places in Antigua. I will compare San Pedro and Panajachel in my next post, but this would be my impression regarding nightlife. 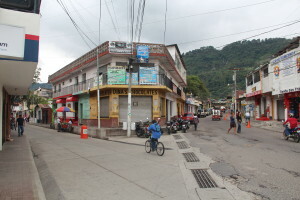 The mix of local/foreigner will be must more tilted to foreigner in San Pedro than it is in Panajachel. With that said, I don’t know if the bars will be anymore crowded. There are simply less tourists in San Pedro.